Lululemon has become a force to reckon with in the clothing retail space. Targeting high-end athletic gear buyers, primarily women, Lulu appears to have dominated the space for several years and breathed life into a clothing niche that’s now seeing strong competition from makers like Athleta, Lucy, Under Armour, and Nike. The success of this company comes, in a large part, from their design but it’s bolstered by the quality present in their products. Ask anyone who wears their garments: Lulu consistently fits well, holds up to regular use, and flatters its owners. You might think that a company with a strong following that’s closing in on $1.6 billion in sales has nothing to fear but you would be wrong. We ran Lulu’s financials statements through our analysis program and found serious cause for concern. Lulu’s story is a great example of a strong product that could be outdone by poor financial management. Companies with sound financial performance typically don’t meander far from their success. Unfortunately, Lulu has. The company holds way too much excess cash, which works to increase its cost of capital and lower its return on assets. 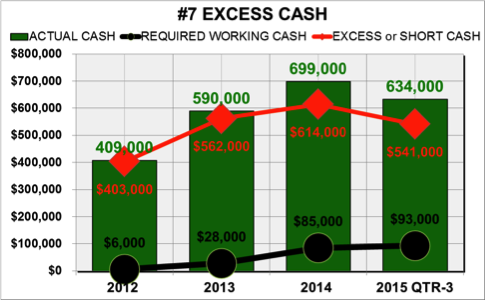 Having this much excess cash – over $500 million – can produce a feeling of overconfidence for management. We can see some of that overconfidence in their poor use of debt. Excess cash often leads to the mindset that money in the bank means nothing can be gained from conservative debt leverage. Lulu also manages their working capital poorly. We see this in their net trade cycle, which is getting longer and longer. 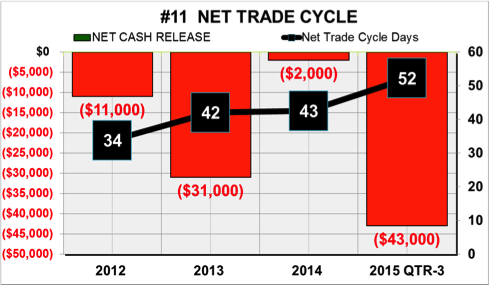 Every day the net trade cycle increases the company’s cash holding is reduced by $4 million. In the meantime, the company keeps increasing its excess cash. This process is counter-productive. Over the last 4 years, cash reduction caused by the deteriorating net trade cycle has reduced cash holdings by around $80 million. In the midst of all this financial inefficiency, Lulu, despite their excellent brand reputation, decides that it would be a good idea to lower the gross profit margin. One year might be understandable but three years with a cumulative decrease of 11% is a disaster waiting to happen. 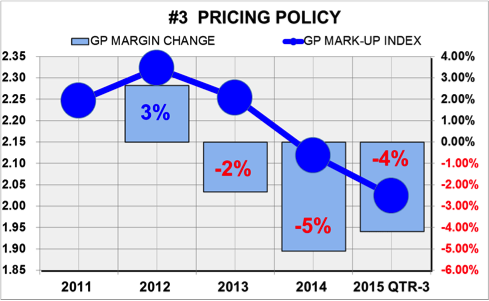 If this move was meant to stimulate sales, it didn’t work; sales growth slowed dramatically over the last 2 years. Lowering gross profit margin should never be used to increase sales, particularly if a brand name product or service is involved. Our advice? If you’re a Lulu customer, buy their clothing now while the margins are thin and quality is still high. If you’re a Lulu executive, reduce the excess cash hanging around and get a handle on your margins before your brand suffers. Nike won’t show you any mercy.